Avocado brown mite is a sporadic pest, mostly in coastal growing areas. Bronzing of leaves, mite cast skins, and partial defoliation of some trees by avocado brown mite is most noticeable from about July to September. Severe infestations tend to occur in border row trees along dirt roads, where road dust is detrimental to mite predators. 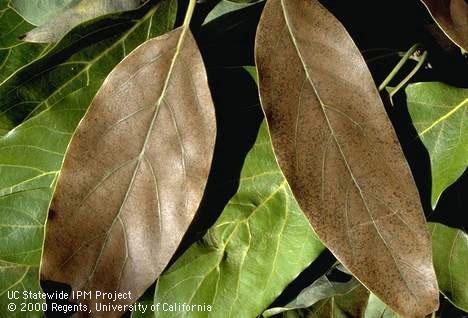 Ash deposited on leaves from wildfires reportedly also causes brown mite outbreaks. Avocado brown mite feeds almost entirely on upper leaf surfaces. Bronzing damage is not severe when mite numbers are low to moderate (about 10 to 20 adult females per leaf). If the spider mite destroyer lady beetle (Stethorus picipes) is present and reproducing well at this time, brown mite does not normally become a problem. Damage occurs if avocado brown mite averages about 80 to 100 adult females per leaf (about 200-300 motile stages, adults and nymphs combined). At these higher densities mites also colonize the lower leaf surface and sometimes fruit, and partial defoliation can occur. These higher numbers cause leaf bronzing along the midrib, then along smaller veins, and finally the entire leaf turns brown. Brown mite is related to Persea Mite (http://ipm.ucanr.edu/PMG/r8400211.html) but rarely causes the damage that its relative can cause. The Persea Mite feeds mainly on the bottom of the leaf and forms web-covered colonies which help to distinguish it from O. punicae (first described in Carthage?). At this stage, unless there is severe defoliation, it might be best to leave it alone until biocontrol kicks in or we get a hot spell to burn it out. Keep the trees adequately watered and flushing new leaves to outgrow it. Call a PCA if you are worried. And whatever happened to the Bagrada Bug?